This solid brick 3 story home, built in 1875, is listed on the National Register of Historic Places. Situated on Main Street, in the heart of the Smiths Grove Historic and Antique district, this home Retains the graciousness and grandeur of the Victorian era. Original heart pine plank flooring and vintage 1927 wool carpet is throughout the home. Every room has been carefully restored and is furnished in beautiful period antiques. 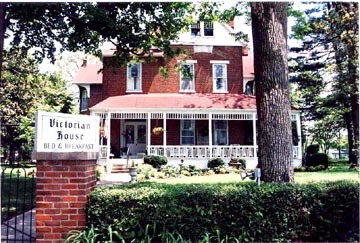 When you stay at the Victorian House you will be pampered with Southern Hospitality, treats and great food. Rest and relax in your spacious guest room, in either of the downstairs parlors, out on the front wrap-around porch or you can wander the two acres of mature trees and gardens that surround the house. Your hosts, Sharon and Dave Dahle want you to enjoy the elegance of this home and want your stay to be an experience you will never forget.